Al Muntada Trust is a hate crime reporting centre. 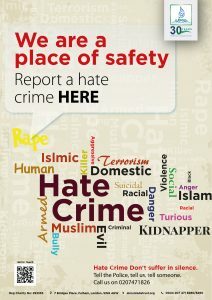 We encourage all those who witness or experience hate crimes to report the incidences. By reporting incidents, you will enable the police, local councils, housing associations etc to build up patterns of behaviour locally, and highlight areas of concern within your community. By reporting the incidence, you can get the support you may need and help ensure that offenders are brought to justice and cannot do the same to other people. Anyone can use the Al Muntada Trust centre to report a hate crime or hate incident – the reporting centre is open to staff and members of the public. Please be aware that Al Muntada Trust will not be responsible for determining the circumstances of the report, the investigation of the report, or the gathering of evidence in relation to the report.